Harold "Farmer" Brown was born and raised on a cattle farm in south central Michigan and spent over half his life in agriculture including three years in the dairy industry. Harold is featured in the Tribe of Heart documentary, Peaceable Kingdom, the Journey Home. His story is one of transformation from animal farmer to vegan animal advocate. He also works as an advocate for animal rights, sustainable independent family farms, environmental justice, social justice, and peace through non-violence. 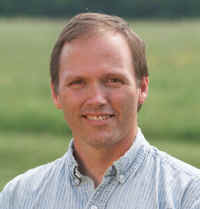 President of Farm Kind, Ltd.